Cars that already have age of at least 3 more years will experience a decrease in conditions, especially on the paint. Not infrequently 3-year-old car body condition and paint is dull and faded. This is due to many factors, the lack of care becomes the main cause of the decline in the condition of car paint. But in addition to maintaining the car paint is always well preserved not enough to just take care of it. Knowledge of car paint care also becomes an important role in maintaining the condition of car body paint. The role of paint on the body of the vehicle is very important, especially when you want to resell the vehicle at a fairly high price. Paint car parts is the first part of the view by prospective buyers, if the condition of the body paint good, prospective buyers will consider other sections such as frames and car engines. Original paint of the vehicle when bought in the first time at the dealer generally has a long enough durability, as long as the treatment is done meet the standard rules. Mistakes are often made car owners to make the car body paint quickly experience dull is when washing the car. Proper car wash time is where the temperature and weather are not too hot, for example morning and evening. In addition, the use of shampoos and foam materials that do not have a standard car was another factor that makes car body paint easy to dull. 1. Condition of the car after the rain should be washed immediately, this is not just a waste of dirt found in the car, but rain water that has a different acidity level with ground water tends to cause fungus and flex on car body paint. 3. Do not use water pressure that is too tight when watering the car. Set the adjustable water pressure so that the dirt can get out of the car without focusing on the car body paint itself. 5. Use soft, soft fabrics to dry the vehicle. Such as kanebo or leather soft cloth. 6. Thorough in using car gloss materials, always use car polishes that have been proven to protect car paint. Having a car that features a shiny paint becomes a pride of its own. In addition to doing good care and right so that car paint can last long can provide great savings on your pocket. Where repainting the entire body of the car requires a fairly expensive cost and sometimes can not get maximum results. 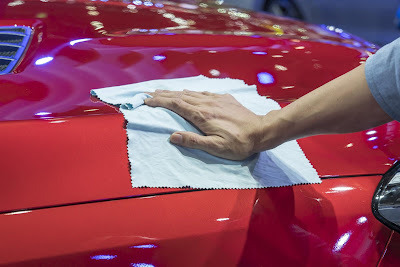 So tips on how to care for car paint to paint the car can always shine and durable.